Gregor Johann Mendel (July 20, 1822 – January 6, 1884) was an Austrian monk whose studies of the inheritance of traits in pea plants helped to lay the foundation for the later development of the field of genetics. He is often called the "father of genetics." His studies showed that there was particulate inheritance of traits according to basic laws of inheritance. The significance of Mendel's work was not recognized until the turn of the twentieth century. Within Mendel, religion and science were harmonized. Living as a monk, he raised and monitored more than 20,000 pea plants inside the walls of his monastery. He was a teacher of physics and also a beekeeper who tried with little success to study the inheritance of traits in bees. His responsibilities in later life in leading the monastery overtook his earlier priority on scientific studies. Some critics have suggested that the data in Mendel's studies is "too good," that by the laws of statistical variation and the linking of certain traits his experimental results should not have conformed as closely to his inheritance ratios as they do. Whether he biased his data either consciously on unconsciously will probably never be known but, regardless, his inheritance ratios have proven accurate and his place at the foundations of genetics is secure. Gregor Mendel was born into a German-speaking family of Heinzendorf, Moravia of the Austrian Empire (now Hynčice, district of Nový Jičín, in the Czech Republic). During his childhood, Mendel worked as a gardener, and as a young man attended the Philosophical Institute in Olomouc. In 1843, he entered the Augustinian Abbey of St. Thomas in Brno. 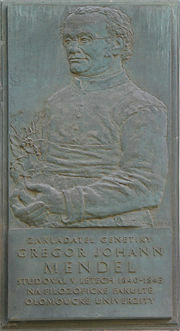 Born Johann Mendel, he took the name Gregor upon entering monastic life. 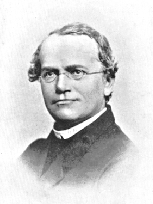 In 1847, Mendel was ordained as a priest. In 1851, he was sent to the University of Vienna to study, returning to his abbey in 1853 as a teacher, principally of physics. Gregor Mendel was inspired by both his professors at university and his colleagues at the monastery to study variation in plants. He commenced his study in his monastery's experimental garden. Between 1856 and 1863, Mendel cultivated and tested some 28,000 pea plants. The Augustinian Abbey of St Thomas, Brno. Mendel discovered that many characteristics of peas had an either-or configuration; for example, pea plants were either tall (as high as six feet) or dwarf (no more than 20 inches high), seeds were either green or yellow and either round or “wrinkled,” with no blending when two variations were crossed. Moreover, he found that he could create pea seeds that “breed true,” that is, seeds that always produced tall vines, and the next generation of seeds from these plants also produced only tall vines. If plants that bred true for tall were crossed with plants that bred true for dwarf, all the seeds produced tall plants. But when these next-generation seeds were planted, the dwarf plants reappeared, and the ratio of tall plants to dwarf plants was close to 3:1. These results showed that heritable traits do not blend but behave as discreet units. In addition, if more than one trait is studied (for example, plant height and seed color), these traits independently assort and are expressed independently of each other. Mendel discovered all this with no understanding of genes, chromosomes, or meiosis whose roles in heredity were elaborated years after his death and which showed how Mendel’s laws are carried out. Mendel's attraction to research was based on his love of nature. He was not only interested in plants, but also in meteorology and theories of evolution. Mendel often wondered how plants obtained atypical characteristics. On one of his frequent walks around the monastery, he found an atypical variety of an ornamental plant. He took it and planted it next to the typical variety. He grew their progeny side by side to see if there would be any approximation of the traits passed on to the next generation. This experiment was designed to illuminate Lamarck's views on environmental influences on plants and their passing on inherited traits to offspring. Mendel found that the plants' respective offspring retained the essential traits of the parents, and therefore were not influenced by the environment. This simple test gave birth to the idea of heredity. Mendel read his paper, "Experiments on Plant Hybridization," at two meetings of the Natural History Society of Brunn in Bohemia in 1865. When Mendel's paper was published in 1866 in Proceedings of the Natural History Society of Brunn (Brno), Mendel requested 40 reprints from the journal editor and mailed at least a dozen of them out to respected scientists throughout Europe, even to Charles Darwin. Yet, it had little impact, and was cited about three times over the next 35 years. Elevated as abbot in 1868, his scientific work largely ended as Mendel became consumed with his increased administrative responsibilities, especially a dispute with the civil government over their attempt to impose special taxes on religious institutions. Gregor Mendel died on January 6, 1884, in Brno, Austria-Hungary (now Czech Republic), from chronic nephritis. 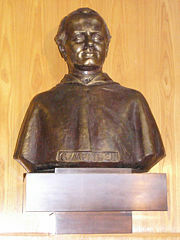 Bust of Mendel at Mendel University of Agriculture and Forestry in Brno, Czech Republic. It was not until the early twentieth century that the importance of Mendel's research and ideas was realized. In 1900, his work was finally rediscovered by Hugo de Vries, Carl Correns, and Erich von Tschermak. Mendel's results were quickly replicated, and genetic linkage quickly worked out. However, a period of tense argument ensued over its significance between William Bateson and Karl Pearson. Ronald Fisher (R.A. Fisher) in 1918 used Mendelian genetics as the basis of the start of the modern synthesis in evolutionary biology. The "re-discovery" made Mendelism an important but controversial theory. Its most vigorous promoter in Europe was William Bateson, who coined the terms "genetics," "gene," and "allele" to describe many of its tenets. The model of heredity was highly contested by other biologists because it implied that heredity was discontinuous, in opposition to the apparently continuous variation observed. Many biologists also dismissed the theory because they were not sure it would apply to all species, and there seemed to be very few true Mendelian characters in nature. However later work by biologists and R.A. Fisher showed that if multiple Mendelian factors were involved for individual traits, they could produce the diverse amount of results observed in nature. Thomas Hunt Morgan and his assistants would later integrate the theoretical model of Mendel with the chromosome theory of inheritance, in which the chromosomes of cells were thought to hold the actual hereditary particles, and create what is now known as classical genetics, which was extremely successful and cemented Mendel's place in history. Mendel's experimental results have been the object of considerable dispute. A renowned statistician, R. A. Fisher analyzed the results of the F1 (first filial) ratio and found them to be implausibly close to the exact ratio of 3 to 1. In 1936, Fisher (1990) published an analysis that concluded "the data of most, if not all, of the experiments have been falsified so as to agree closely with Mendel's expectations," and in private, he referred to this discovery of "faked" data as "abdominable" and a "shocking experience" (Box 1978). The subject remains controversial today. Only a few would accuse Mendel of scientific malpractice or call it a scientific fraud—reproduction of his experiments has demonstrated the accuracy of his laws. However, the results have continued to be a mystery for many, though it is often cited as an example of confirmation bias, and he is generally suspected of having "smoothed" his data to some degree (not knowing about the importance of blind classification). The fact that Mendel's reported results concentrate on the few traits in peas that are determined by a single gene has also suggested that he may have censored his results, otherwise he likely would have stumbled across genetic linkage, either in peas or in the other species he studied. Genetic linkage occurs when particular alleles (different DNA codings of the same gene) are inherited together. 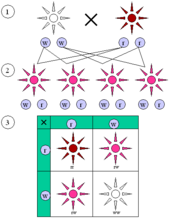 Because chromosomes are sorted randomly during meiosis, generally an allele can be passed on and considered independent of those alleles for other genes. However, alleles that are on the same chromosome are more likely to be inherited together, and are said to be linked. These facts remain a paradox, as Mendel has a reputation as someone of great integrity with a passion for science, as well as intellectually gifted with strong powers of observation. Figure 1 : The color alleles of Mirabilis jalapa are not dominant or recessive. (1) Parental generation. (2) F1 generation. (3) F2 generation. The "red" and "white" allele together make a "pink" phenotype, resulting in a 1:2:1 ratio of red:pink:white in the F2 generation. Figure 2 : Dominant and recessive phenotypes. Also known as Mendel's First Law. The rediscovery of Mendel's work led to classical genetics, in which Mendel's Laws are expressed in terms of genes and alleles. Alternative versions of genes account for variations in inherited characters. This is the concept of alleles. Alleles are different versions of genes that impart the same characteristic. Each human has a gene that controls height, but there are variations among these genes in accordance with the specific height for which the gene "codes." For each character, an organism inherits two genes, one from each parent. This means that when somatic cells are produced from two gametes, one allele comes from the mother, one from the father. These alleles may be the same (true-breeding organisms, e.g. ww and rr in Fig. 1), or different (hybrids, e.g. wr in Fig. 1). If the two alleles differ, then one, the dominant allele, is fully expressed in the organism's appearance; the other, the recessive allele, has no noticeable effect on the organism's appearance. In other words, the dominant allele is expressed in the phenotype of the organism. However this does not always hold true: Today, we know several examples that disprove this "law," e.g., Mirabilis jalapa, the "Japanese wonder flower" (Fig. 1). This is called "incomplete dominance." There is also "codominance" on a molecular level, such as found in people with sickle cell anemia, when normal and sickle-shaped red blood cells mix and prevent malaria. The two genes for each character segregate during gamete production. This is the last part of Mendel's generalization. The two alleles of the organism are separated into different gametes, ensuring variation. Some traits do not follow these laws Mendel had reported, because they are linked with other traits. (1) Parental generation. (2) F1 generation. (3) F2 generation. Results : 9x short black hair, 3x long black hair, 3x short white hair, 1x long white hair. Also known as Mendel's Second Law. The most important principle of Mendel's law of independent assortment is that the emergence of one trait will not affect the emergence of another. While his experiments with mixing one trait always resulted in a 3:1 ratio (Fig. 2) between dominant and recessive phenotypes, his experiments with mixing two traits showed 9:3:3:1 ratios (Fig. 3). Mendel concluded that each organism carries two sets of information about its phenotype. If the two sets differ on the same phenotype, one of them dominates the other. 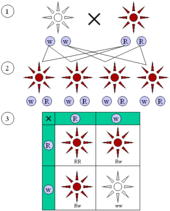 That way, information can be passed on through the generations, even if the phenotype is not expressed (F1 generations, figures 2 and 3). Mendel's findings allowed other scientists to simplify the emergence of traits to mathematical probability. A large portion of Mendel's findings can be traced to his choice to start his experiments only with true breeding plants. He also only measured absolute characteristics such as color, shape, and position of the offspring. His data was expressed numerically and subjected to statistical analysis. This method of data reporting, and the large sampling size he used, gave credibility to his data. Mendel also had the foresight to look through several successive generations of his pea plants and record their variations. Without his careful attention to procedure and detail, Mendel's work could not have had the impact it made on the world of genetics. Mendel lived around the same time as the British naturalist Charles Darwin (1809–1882), and many have fantasized about a historical evolutionary synthesis of Darwinian natural selection and Mendelian genetics during their lifetimes. Mendel had read a German translation of Darwin's The Origin of Species (as evidenced by underlined passages in the copy in his monastery), after completing his experiments, but before publishing his paper. Some passages in Mendel's paper are Darwinian in character, evidence that The Origin of Species influenced Mendel's writing. Darwin apparently received a copy of Mendel's paper, but there is no evidence he read it; he also had a book by Focke with references to it. A leading expert in heredity at this time was Darwin's cousin Francis Galton, who had mathematical skills that Darwin lacked and may have been able to understand the paper had he seen it. In any event, the modern evolutionary synthesis did not start until the 1920s, by which time statistics had become advanced enough to cope with genetics and evolution. Bateson, W. 1902. Mendel's Principles of Heredity, a Defense. London: Cambridge University Press. van der Waerden, B. L. 1968. “Mendel's experiments.” Centaurus 12:275-288. This page was last modified on 23 January 2013, at 23:27.